This country retreat on Snap Bean Farm was once the home of Joel Chandler Harris, author of the Uncle Remus Tales. Harris was also a prominent journalist and editor of the Atlanta Constitution newspaper. Influential black songwriter, author and statesman, James Weldon Johnson, said in 1921 "the Uncle Remus Tales constitute the greatest body of folklore that America has produced." Harris had just published his first Uncle Remus book when he moved to this house in 1881, and did most of his subsequent writing here until his death in 1908. The building was constructed in 1870 as a simple farmhouse by George Muse, founder of Muse's Clothing, a well-known and established Atlanta store that was in business for more than 100 years. Eleven years later, Harris rented the house and later purchased it in 1883 from his employer at the newspaper. He hired architect George P. Humphreys of the firm of Norrman and Humphreys to remodel the house into a rambling one and one-half story frame cottage in 1884. The residence embodies distinct characteristics of the Queen Anne style, which include an asymmetrical plan with a steeply pitched gable roof and a heavily latticed porch, surrounded by trees and gardens where Harris raised a variety of fruits and vegetables. Harris also built homes for three of his children on lots on the west side of his property facing Lawton Street. Today, two of these remain and are private residences. 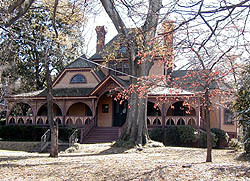 More commonly known as the Wren's Nest, today it is the oldest house museum in Atlanta. Largely unchanged since Harris's death, the historic home contains the original Harris furnishings as well as the original paint colors. It is an excellent and rare example of the early Victorian Queen Anne style in the Atlanta area. 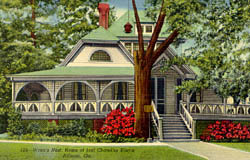 The house was dubbed the Wren's Nest in 1900, when the Harris children discovered a wren had built its nest inside their mailbox. They promptly erected a second mailbox so the birds would not be disturbed. The Wren's Nest was designated a National Historic Landmark in 1962. The Joel Chandler Harris Home, more commonly known as the Wren't Nest, is located at 1050 Ralph David Abernathy Blvd., in SW Atlanta, off I-20 at exit 55A. It is open from Tuesday-Saturday, 10:00am to 2:30pm, except major holidays. Guided tours are offered during regular hours. Special storytelling sessions, a reading garden, amphitheater space, and a museum store are all available. Call 404-753-7735 or visit their website for more information.